(CNN) -- China acknowledged Sunday that security forces shot dead 12 people during ethnic riots in the northwest earlier this month. Police patrol Urumqi, China, on Saturday, July 11. 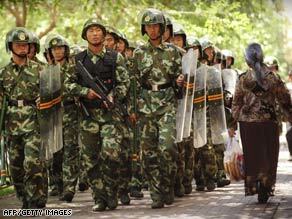 Officials also said Sunday that the death toll from the violence in the Xinjiang region had risen to 197. The government had previously said the fighting killed at least 184 people and wounded more than 1,000. Nur Bekri, chairman of the Xianjiang regional government, said police officers in the capital Urumqi shot 12 "mobsters" after failing to deter them by firing into the air, state-run media said. Three of them died on the spot, while nine died later, the Xinhua news agency said. He did not say whether the "mobsters" were Uyghurs, who are predominantly Muslim, or Han, who are the majority in China. The rioting stemmed from an incident in June when a brawl broke out between Uyghur and Han workers at a toy factory in Guangdong province in southern China. Two Uyghurs reportedly died. To protest the deaths, Uyghurs took to the streets in Urumqi -- and fighting erupted. "But we could never imagine that the mobsters were so extremely vicious and inhumane," Bekri said, adding that the "thugs" used iron rods, stones and bricks to kill innocent residents. The Xinjiang Uyghur Autonomous Region is home to about 20 million people and 13 major ethnic groups -- of which the Uyghur is the largest. Some Uyghurs resent the presence of Han in Xinjiang, many of whom came looking for work. Urumqi: How to heal the wounds? A militant leader whose group has links to al Qaeda has denounced Chinese treatment of Uyghur Muslims and threatened to seek "revenge." The leader of the Turkistan Islamic Party, in a video that appeared on Islamic Web sites, blames the Chinese for "genocide" against people in East Turkistan -- what some Uyghurs calls the region of Xinjiang province in western China where they live. The remarks were delivered by Seyfullah, commander of the Turkistan Islamic Party and dated July 8. They came after the violence erupted between Uyghur Muslims and Han Chinese. The speaker urged his people to "kill the Chinese Communists where you find them, take them and besiege them and ambush them wherever you can." "Let them know that these Muslim people have men who will seek their revenge and they are about to do that very soon, before the horses of God will reach you, God willing, so be prepared for that moment because we are too getting prepared." The U.S. State Department said the group has taken credit for violent incidents in the past.